Are you looking to discover something new during your vacation this year? Don’t forget about the most famous place in the world ‘Universal Studios in Orlando, Florida’. The best place to have lots of fun and enjoyment. There should be something that enfolds much aspect in it to give it a must watch. Here we can show you why it is necessary to visit Universal Studios Florida during vacation. The Simpsons Ride is a simulator-style ride located in Universal Studios Florida. Opened in 2009 to replace Back to the Future, the attraction takes you inside the world of the Simpsons as you visit Krustyland with Homer and the gang.While the ride itself feels a bit dated–after all, every amusement park in the world has simulator rides–what sets The Simpsons Ride apart is the signature humor of the family. Several shots are taken at your stereotypical park employee, the silliness of carnival games, counter service food, the “convenient” locations of gift shops, and much more. For fans, the ride also features many, many characters from the show. OI tip Going on The Simpsons isn’t so much about experiencing a thrill ride as it is about getting to watch another (good) Simpsons episode in a completely new format. If you have ever watched the show, you’ll feel immediately at home when you enter through the doors, and the sizable cast and one-liners will keep you coming back to see what you missed. Revenge of the Mummy, Universal Studios Florida’s indoor roller coaster, is the best thrill ride at USF. Even the much newer Hollywood Rip Ride Rockit, with its customizable music and 90-degree lifthill, can’t beat Mummy’s unique ride experience, unanticipated thrills, and genuine fun. The Mummy really is the best mix of ride technology and classic coaster twists and turns.And yes, it is located directly across from Finnegan’s, an Irish pub and restaurant. That means you can get a drink to help your nerves before the ride, and you can get a drink to celebrate your accomplishment after. “Your souls are mine!” Revenge of the Mummy is a not-to-be-missed high-speed, indoor rollercoaster similar to Disney’s Rock ‘n Rollercoaster (except you do not go upside down on The Mummy). The attraction does a fantastic job of bringing The Mummy story to life with plenty of thrills and personality. Harry Potter and the Forbidden Journey in Universal Studios Florida, the signature attraction inside Hogwarts at IOA’s Wizarding World of Harry Potter, is a theme park experience like no other in the world. And best of all, it is actually two attractions built as one. The first attraction, which is the ride queue, is a tour through Hogwarts castle. This is an incredibly detailed, vibrantly immersive, true-to-the-books-and-movies walk-through of the castle’s most famous rooms. Also, if you don’t pay attention, it is easy to miss the storyline that is being presented. The second attraction, which is the thrill ride at the end of the tour, is nothing short of sensational (in the truest sense of the word). I’ll leave it to others to describe it in detail. Let me just say that the tag line, “His journey is now yours!” is extremely descriptive. Yes, the ride might possibly be too scary if you’re a young kid or if you don’t like spiders. Harry Potter and the Forbidden Journey, with its nearly flawless presentation of Hogwarts castle and one-of-a-kind ride technology, is currently the reference for all new theme park attractions. Congratulations to Universal’s Creative Team. Even before the opening of the Wizarding World of Harry Potter, Universal’s Islands of Adventure was considered by many to be the most technologically advanced theme park in the world. The best display of this original claim can be found at the Amazing Adventures of Spider-Man in Universal Studios Florida. 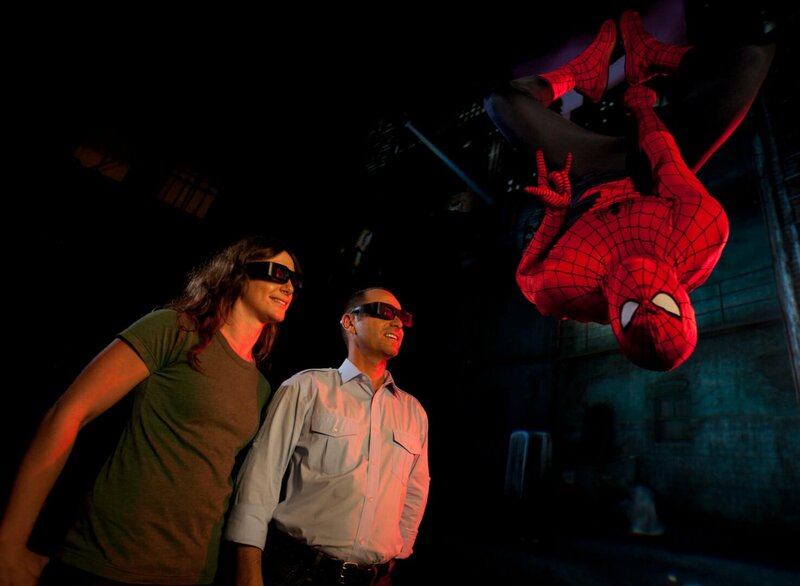 It was the first attraction of its kind, combining a true 3D film experience, simulated motion, real-life effects and pyrotechnics, all while moving down a track in a then state-of-the-art ride vehicle. Now more than a decade old, it is still a very satisfying experience, and one that virtually anyone can enjoy (unlike the attraction that finally upstaged it, Harry Potter and the Forbidden Journey, which is pretty scary if you don’t like spiders or turning almost upside down). This one’s got a single rider line too. 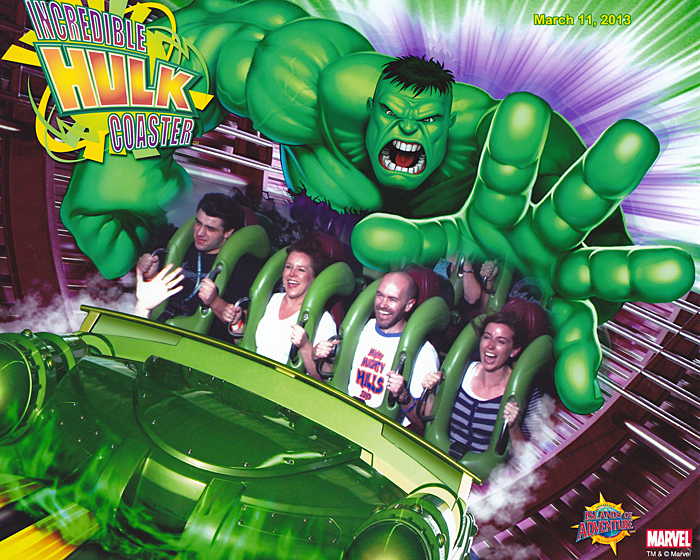 Even though it shares a birthday with the Spider-Man attraction (1999), The Incredible Hulk Coaster still is the best roller coaster in Universal Studios Florida. Sure there are prettier ones that have been built since Hulk made its presence known, like Disney’s Expedition Everest; and there are fancier ones out there now, like SeaWorld’s Manta. But nothing beats Hulk for the nail-gripping, visceral, I’d-never-go-on-that-because-I‘m terrified-of-going-upside-down to oh-my-god-can-we-do-that-again coaster experience. With a launch tunnel that ejects you at 40 mph in two seconds to the track wrapping around the entry to Marvel Super Hero Island, this is a coaster that’s almost as much fun to watch as it is to ride. Do it, and then prepare to do it again. See, how amazing it is to visit Universal Studios during vacations. So, don’t wait for a single minute and make a plan with your loved ones now to get the joy of this amazing place in Florida. We hope you enjoyed reading our exclusive research on Click for more info. We bet you did! We are updating new information on Orlando FL vacations constantly.